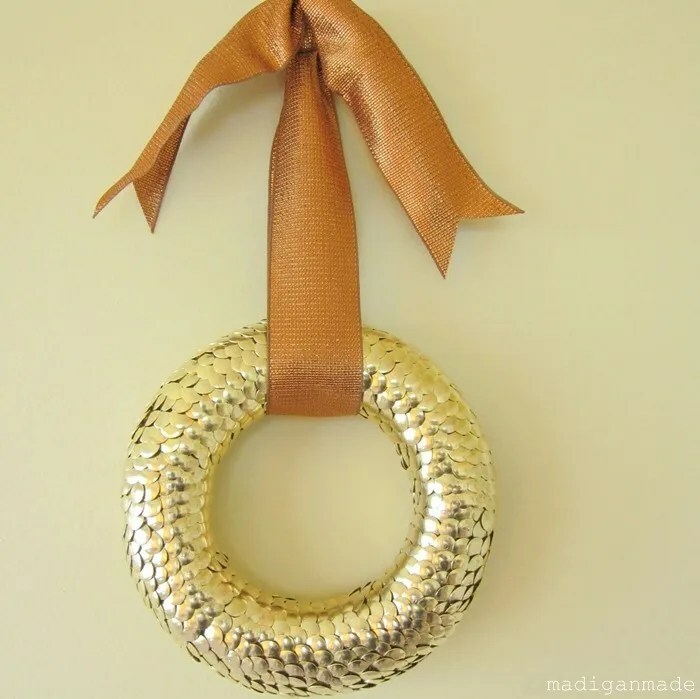 Madigan made… a wreath out of metal brass tacks for fall. I wanted to make a new wreath this season and gold seemed like the perfect color for a fall wreath. I think it looks great with a copper ribbon, too. There is something about the warmth of gold and copper together that reminds me of fall. Don’t get me wrong, I love my brushed nickel and stainless steel. But I’m slowly warming up to the use of gold and brass in my home. (pun intended!) Gold can scream terrible and tacky 1980’s decor… but used thoughtfully, I think it can add a layer of coziness and brightness to a space. To me, mixing gold and copper is a natural autumnal combination. 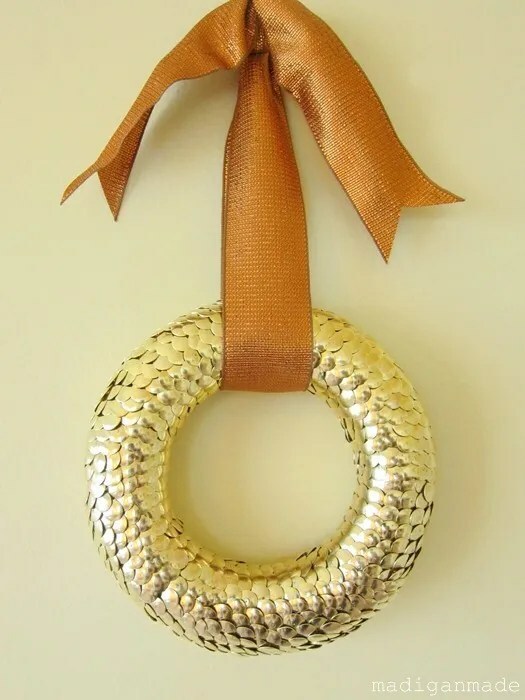 Using a copper ribbon with my new gold tack wreath seemed perfect for this upcoming season. Well, after I made my thumbtack covered globe, I knew I could cover other things with tacks for a unique texture. I figured, why not try it on a foam wreath? 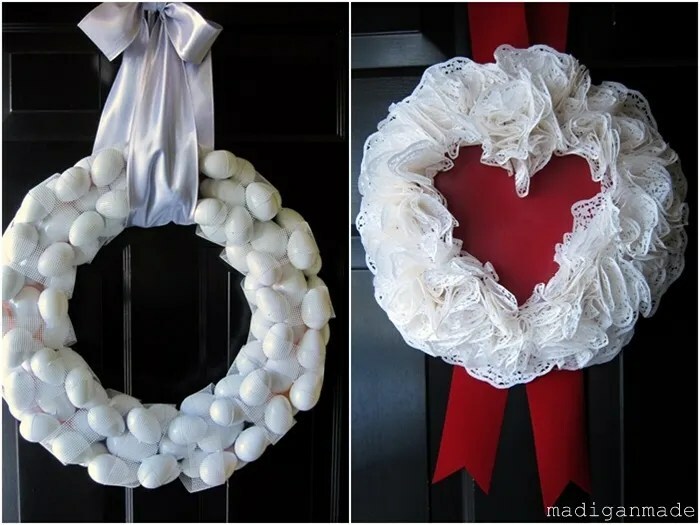 The steps to making this wreath were simple. I used a small six-inch wreath form and several boxes of brass tacks (Tip: the dollar store sells boxes of 300). I started with a circle of tacks around one section and just kept poking the tacks in and layering them on top of each other. I worked my way around the wreath layering the tacks. The ribbon covers the area where the two ends meet up, because it was hard to make that transition look seamless. This wreath took a loooong time to finish (a perfect tedious job to do in front of the TV) and it used at least 2-3 boxes of 300 tacks. And boy it is heavy!! I only used a six-inch wreath form… I can’t imagine how much it would weigh if I made it bigger. 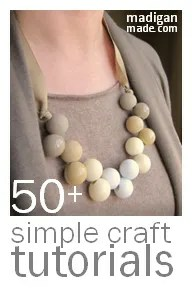 But I love the unexpected wreath materials. The tacks create great texture and you need to do a double-take when you first look at it. I’m sharing this wreath over at the Nester’s “You Made a Wreath Out of What?” Party. 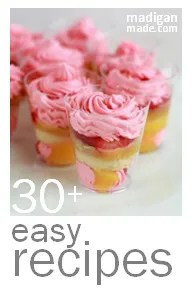 Go over and check out her link party – it’s a great idea for a linky and sure to give you some fun ideas. 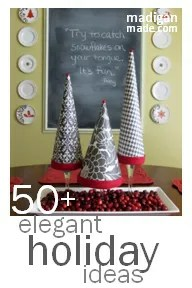 And if you are a regular reader of this blog, you’ve seen me make other wreaths out of some non-traditional materials. Remember my Hawaiian flower leis and ball pit ball wreath for summer? 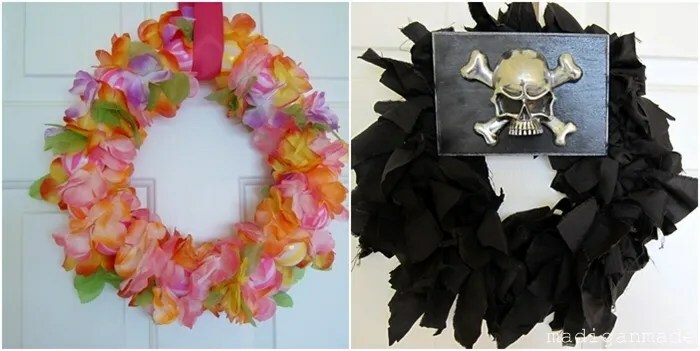 Or how about the chrome skull motorcycle part wreath from last Halloween? I loved my big ol’ white wreath I made from plastic Easter eggs and dry wall tape. And that doily wreath I made on a red plastic paper plate? So cheap and pretty! 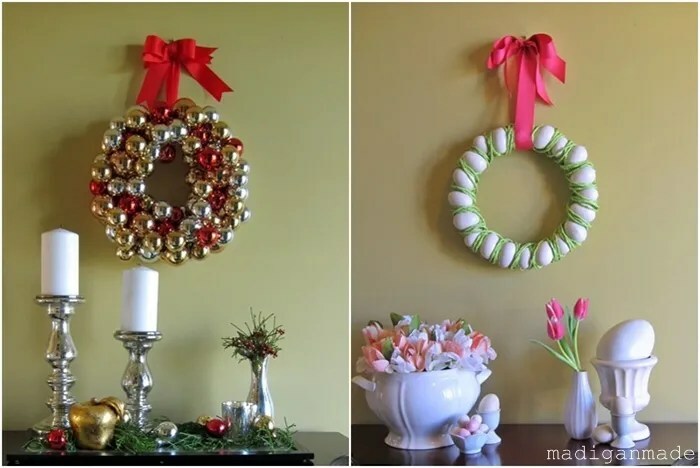 These last two wreaths used more expected materials, but are worth mentioning: our Christmas ornament wreath and the simple Easter wreath from egg vase filler and raffia. 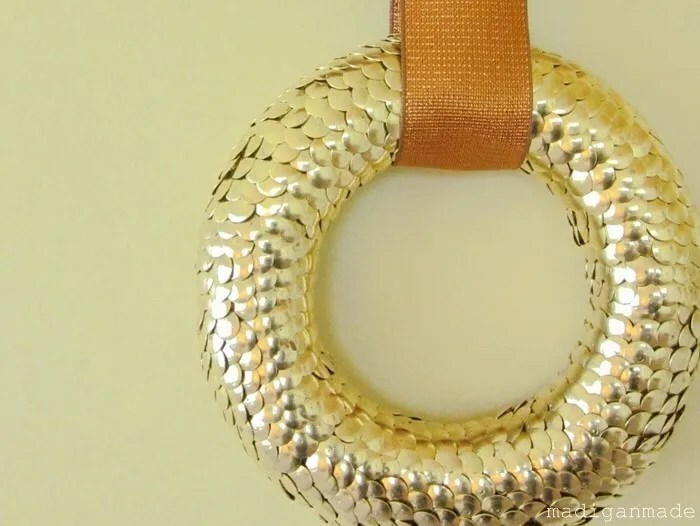 But I think this brass tack wreath is now my #1 favorite. It’s a little rock star, no? 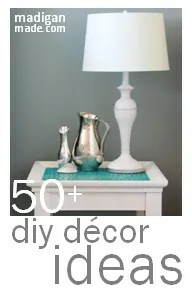 The gold texture is simple and clean, but the tacks look almost like a hammered metal finish. It also kind of reminds me of a snake skin, too. I guess I could paint the wreath… but as I alluded to above, I prefer the warmth of the gold. What I love is that at Christmastime, I can just change out the copper wreath for a burgundy one and have another holiday look! 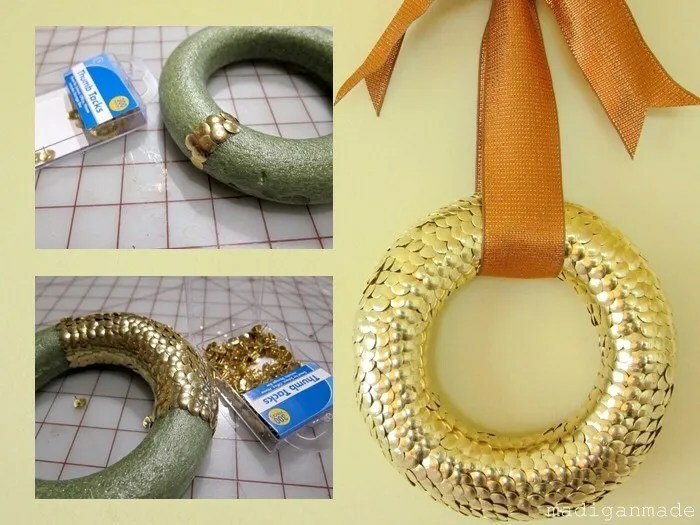 How about you… have you ever created a wreath out of unexpected materials? If you need inspiration, be sure to check out the Nester’s party for fun ideas.